We are going to the Florida Keys! We have traveled 633 miles from Renfro Valley KOA in Mount Vernon, Kentucky to Folly Beach at Charleston, South Carolina. This completed the first leg of our journey to Alaska. Now we are on our second leg of the journey. From Folly Beach at Charleston, South Carolina, to the Florida Keys in Florida. Weather: A brisk day with lots of progress. We sleep in in our very comfortable beds at the Holiday Inn. We open up the curtains and see the waves of the Atlantic Ocean. It is so inviting, we hurry to get dressed so we can get breakfast. Breakfast is complimentary. And compliments to the cheff! It is a display of delight. Breakfast rolls of all kinds, cereal in all sorts, milks, orange juice, coffee, bacon, sausages, eggs cooked to order, biscuits and gravy, and last but not least, a delicious fruit tray. We keep walking back and forth. We are in no rush this morning. We finish breakfast and get ready to go into the ocean. 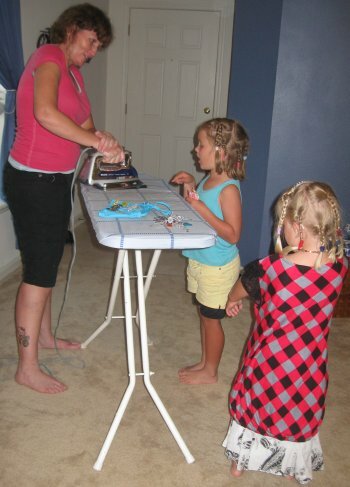 Bill takes the girls to go swimming while Amarins wraps up the room. At last it is time to say goodbye to the ocean for now. We have lunch lined up at Applebees, then a stop at the bicycle repair shop. When Bill gets back with the girls, we are ready to go. The marshes look beautiful as we wave at them. It is a mesmerizing area to be bicycling through. Traffic again is very gracious. Once Amarins makes eye contact with the driver behind us, Bill can move over into the lane if he has to. We are working in harmony with the traffick. At Applebees we stop for a quick lunch. We are somewhat on a time schedule, because the bicycle store has a short period of time available to help us out. It turns into lunch with the press. We have channel 4 and 5 from Charleston 'joining' us for lunch. We are going to be on both channels tonight. 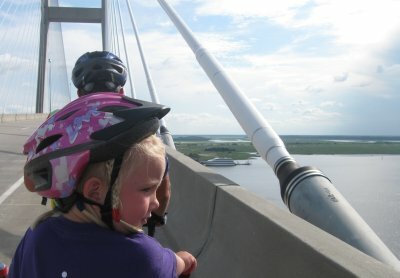 It is wonderful to be sharing our journey with the entire Charleston area. Between shots we eat our delicious lunch. Then it is off again. 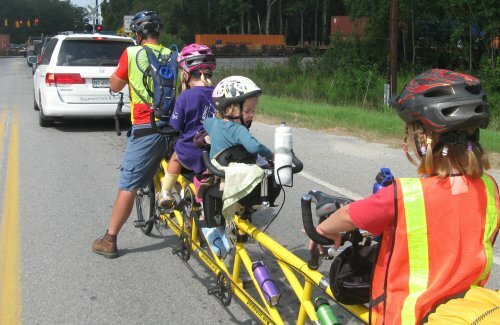 The Charleston bicycle company is located a couple of miles east on highway 17. Without a problem we locate it, the press is there waiting. We get fixed up right away. New handle bar tape, crankarms moved around, new pedals for Bill and Amarins, the rear tire warp mostly worked out; before we know it we are back on the road. 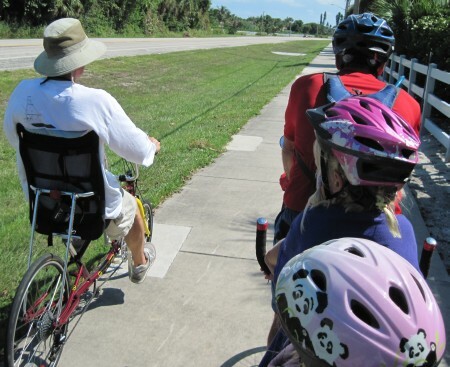 The bicycle store lets Cheyenne and Jasmine ride small bicycles in the road. It is a joy for them. Inside is a big box of toys, gladly used later for entertainment. Great service! When we are all good to go again, we continue our journey down highway 17. We checked online and found a campground not to far from here. On our way to the campground we stop at the Publix for supplies. While Cheyenne and Jasmine help Amarins shop, Bill and Robin do the 'public relations'. We are so glad when we see the turn off for the campground. It is time for us to finally have a real day off, without having to pack up again. It is the first time in ten days that we take a whole day off. While we set up camp, the girls play on the playground which is located right next to our campsite. We brought supper from Publix, so that is easily fixed. At 6pm we call it a day and snuggle up inside our tent. Weather: Cloudy with some sunburst. We sleep the night away no problem. It is after seven when we finally get up. We are not going anywhere today. And it feels great. 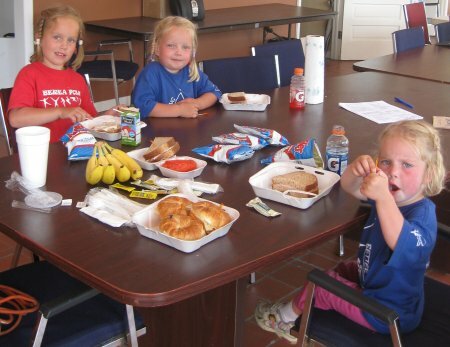 The girls immediately go to the playground, while we get our selection of breakfast foods ready. The campground is exactly what we need. The bathroom facilities are clean, there is a playground, a swimming pool and wireless internet at our site. After breakfast Bill takes the girls swimming. Amarins gets a chance to update the website. One of the fellow campers offers Amarins a ride to the store. Two gallons of water, potato wedges, hotdogs, eggs, dried and fresh fruit, as well as a chocolate bar and chocolate cookies are it for tonight. After finishing a quick lunch we all are taking a nap. Cheyenne says she isn't tired, but she eventually falls asleep as well. The afternoon is a wonderful repeat of this morning. Peaceful and relaxing. Exactly what we need. We have supper with the fresh store supplies we bought. Again we go to bed early. It's been a great day of resting. Weather: Despite a rainy forecast, it was plenty sunny and warm. After such a restful stay it is hard to pack up and go again. But we are finally ready at a quarter before eight. Instead of going back on highway 17, we keep on the backroad. A good choice. Traffic is light and the little traffic that's there has apparently seen us on tv or in the newspaper. We get quite a couple of honks and waves. From time to time we pull over to talk with some folks. One time we stop and talk with Billy (thanks for your generosity! ), Jim and Rhett from the South Carolina Gas&Oil company, the next time for a delightful older couple. It is wonderful to be able to put a smile on their faces. We are blessed to be on this journey. We keep on hoping to find a good place for breakfast, but won't find one until we get to Jacksonboro. A chicken place and a filling station with a small general store will do. We've already been 22 miles on the road, a good part of today's journey. When we pull into the filling station, trucker Donnie is waving us down. He has seen us in the news paper and would like to have our autographs! He encourages what we are doing and supports us with breakfast and a safety jacket. Thanks Donnie! Instead of taking highway 17 we choose to take stateroad 64 towards Walterboro. Then cut over to Hendersonville where we pick up Alternative 17 to Point South KOA. This choice is the right one. Not a lot of traffic, a beautiful road, great scenery. This certainly is not an easy warming up after a day off. We could have done with less miles. The generosity of Point South KOA pulls us near. 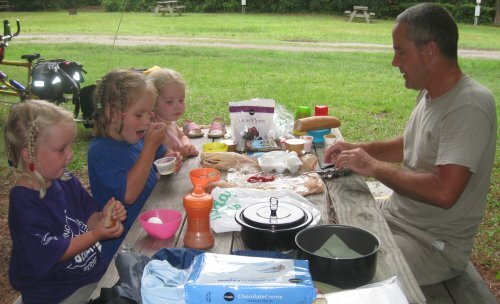 The knowledge of a well kept campground is wonderful to look forward too. We are getting back on highway 17. The road is under construction. The old layer is scraped off. This causes for a tense situation as Bill is working hard on keeping the bike steady on the road while working with the traffic to keep us safe. We are inching closer to the KOA. Finally we are off this horrible road construction. We pull into the KOA at exit 33 off of I-95. Here waits a surprise for us. 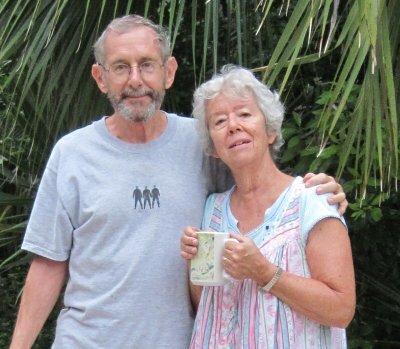 Bill and Barbara, the owners, have decided to put us into the caboose! This is a great surprise. The girls are loving it. And so do we. Setting up camp is easy as one two three. Then we put our bathing suits on and head for the pool. Bill is laughing at Amarins while she is showing a definite biker tan. Well, it doesn't keep her from swimming. After swimming we enjoy the hot tub. How good does that feel. For supper we decide on a pizza. At the campground these are freshly made. Jasmine prefers the chicken. We eat until there is not a crumb left. Then it is time to climb into the caboose and dream of the roads still to travel. 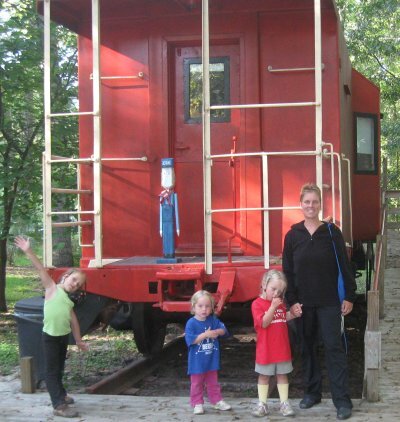 We slept wonderful in the caboose. The morning has already started. We gather our things and load the bike, ready for another day of experiences. 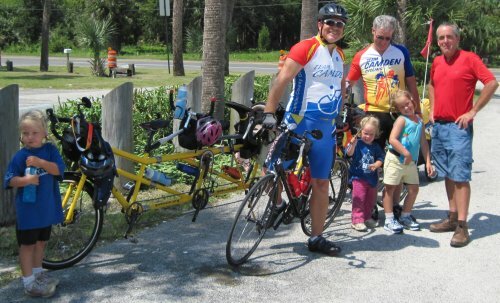 We say our thanks to Bill (of Point South KOA) and pedal further south. With just a snack as breakfast we run out of muscle fuel quite quickly. The morning is beautiful. 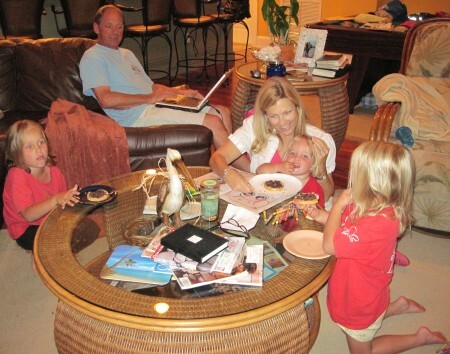 With a growling bellies, we stop from time to time for another snack, before we make it to Ridgeland. Here we settle down for some real fuel: waffles, bacon, eggs, hashbrowns, orange juice. Just south of Ridgeland we enter a lane. The trees are so big and the canopy so wide and thick. It is as if we are going through a tunnel. A gorgeous place for a pick nick and for discovering the area. Bill and the girls are roaming the woods when they stumble upon a discovery. A cicada just molted and was still sitting on its shell. 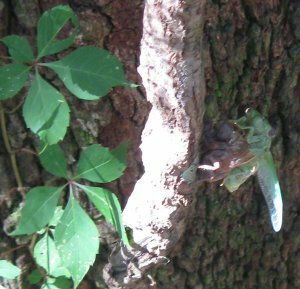 Click here for a neat movie of a cicada shedding its skin. We continue further south on highway 17. The road runs parallel to I-95. It is a bit noisy, but the nature is still enchanting. 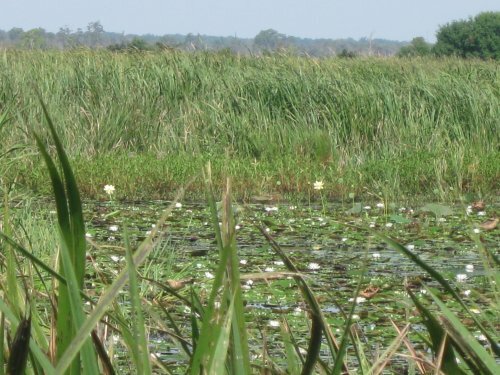 We go through swampy areas where there are plenty of flowers to enjoy. Just before we reach Hardeeville we see a pond filled with gorgeous water lilies. We can tell we are moving further and further south. We are not only outrunning the coming fall season, we are also catching up with summer. It is getting hotter and more humid. 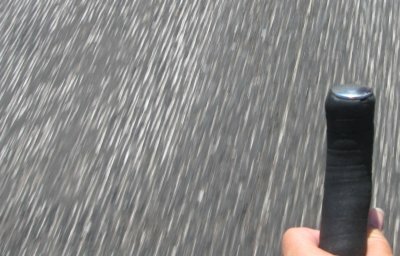 Starting late is nice for sleeping in, but not beneficial for riding a bicycle for an extended period of time. We planned to go to Georgia today, but decide to find the campground at Hardeeville. From different people we get different directions on how to get there. Some even say it's been out of business for many years. A Burger King with playground provides a good stop to regroup and figure out what to do. At the playground we meet a hispanic lady (Miriam) with her boys and a friend. Great playmates for the girls, great conversation for us. They don't know about a campground, but if we want, we can put our tent up at their place. What an experience! 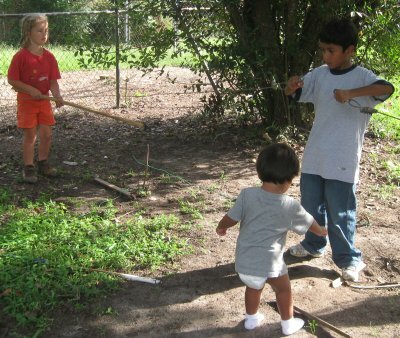 While we pitch the tent, Omar and Kerly Jr share their toys with the girls. They are having a good time playing. For supper we have sopa (soup) to start with. It is their custom to eat at about 9pm. Husband Kerly is home from work. By that time the girls are in bed. Miriam is a great cook and makes tacos filled with mashed potatoes with cheese, cream cheese and cabbage on top. Delicioso! Weather: Perfect for a siesta. It is Omar's birthday, he turned eight. This makes for an even more interesting day. Today is also the day that the family goes to worship, Shalom Sabado. It will all be in spanish, but that doesn't matter to us. It will be an enriching experience. There are quite a number of children. It is not easy to keep them all quiet during the service, but it all works out just fine. Every Saturday they have a potluck after the service. We get to taste many different kinds of mexican dishes. On top of that we have a good time feeling welcome in this warm community. Back home we settle down for a siesta. Cheyenne and Jasmine watch some tv with Omar, who eventually falls asleep on the carpet. 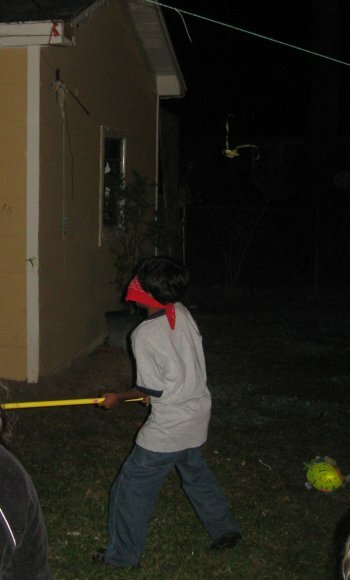 He knows that there is still an entire evening to come, with a piñata party. One after another we all emerge from our sleeping spots. Miriam goes back to work in the kitchen. The kids go back to playing. The other grownups sit down and talk. After a visit to the new church building and a stop at the store to re-supply, it is time to start the party. One after another cars roll into the street. People are parking left and right. Chairs get pulled out the back of pick-ups. The grill is going. Hamburgers are on the way. At the central table a couple of ladies are fixing tostadas. Bill gets a plate full in his hand. Amarins starts with one. Mmmmm they are delicioso! Una mas tostada por favor! We keep on eating. Besides great food we meet great people. We are sharing about our life before the bicycle journey. They are sharing about their life in Mexico and here in the United States. It is a good experience learning about different cultures. The girls are accepting everyone as they are. They are engulfed in a different culture, but they take it as their own. It is love and friendship that matter, where someone was born and raised doesn't change a thing. 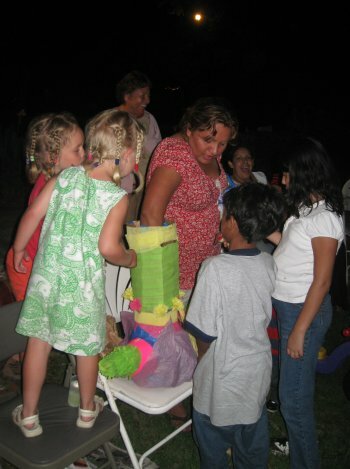 The kids are all checking to see if Miriam is putting enough candy in the piñata. With their approval, it is time to hang it up and see who can beat it to pieces. Everyone gets a turn until it is broken. Omar gets a first shot, since it is his birthday. He immediately hits an 'arm' off. 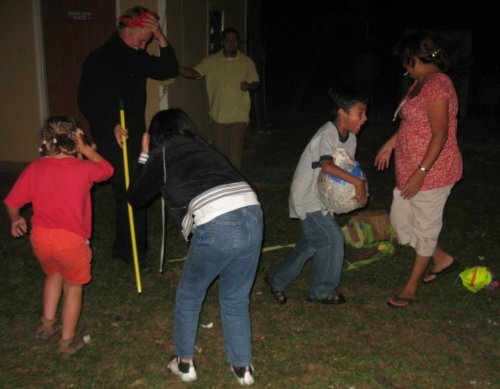 All the kids jump in to get as much candy as possible. Jasmine and Cheyenne also get to swing at it. It is a lot of fun. Eventually it is Amarins who hits it in half. Then it is time to load up on candy. With bags of candy we call it a night and turn into the tent. After a late nighter we are no early birds. 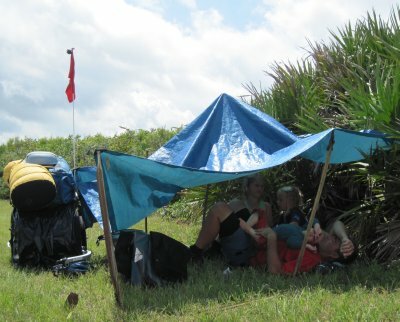 We sleep in until the sun hits the tent and we feel like we are roasted. Slowly we get packed up and ready to be on the road once more. We want to take advantage of this Labor Day weekend to work our way around Savannah and past Brunswick. At 10am it is time to go. Many experiences and new friends richer, we leave Hardeevill behind us and head for the Savannah river. There is little traffic on the roads. The road takes us to the wildlife refuge. Nature is abundant. Lilies are everywhere. Between the lilies are some tall big yellow flowers. The girls take it very well. They get to see many airplanes take off and land. We have to stop for a train, so they get to see a train rolling by. 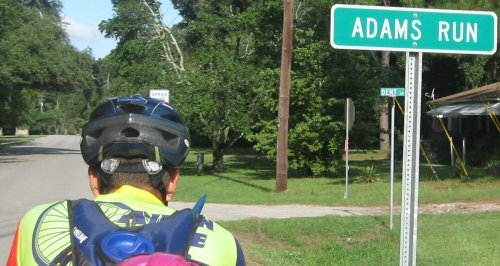 Back on the right track, it is no problem to work our way around Savannah and get back to highway 17. We pedal and pedal and take breaks from time to time. Before we know it we are back at I-95, this time exactly where we want to be, in Richmond Hill. Time for another KOA campground. Marty from Renfro Valley KOA arranges a site for us. Bill sets up camp, Amarins and the girls are going swimming. Cheyenne is like a mermaid, more under water than above. Jasmine is building more and more confidence and is learning to stretch out. Robin enjoys to hop from the stairs to the kiddy pool and back. For supper we have pizza. We share with our neighbors from England. They have travelled through Asia, Australia and New Zealand. Now they are on their last leg of their journey, the United States. Their thought was to travel now before they have children. Now they have seen us, they know traveling with children is possible. 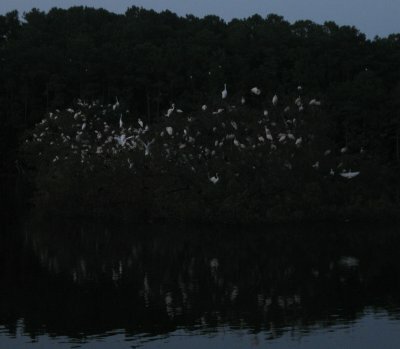 When the birds settle down for the night on the bird island, so do we. We are up early. We hurry to get packed up to go. The mosquitos are biting us left and right. We skip breakfast to get away from them. Once we are finally 'safe', we take a break and sit down to eat. Today we plan on going to Brunswick and have the day off there. Cheyenne is in need of new shoes. Brunswick looks like a good town to find some. Mile after mile we enjoy the scenery, the spanish moss, the butterflies and the lilies. We ride through small communities, we see the smallest church of America, we are followed by a three legged dog. We snack and we pedal, we roll and we stop. We are alive. We are together as a family on an unforgetable journey. After lunch time we get to the town of Darien. We find a place to lunch on the river. A little pond is next to the entry way. In it are turtles and a couple of fish. The girls are loving it. 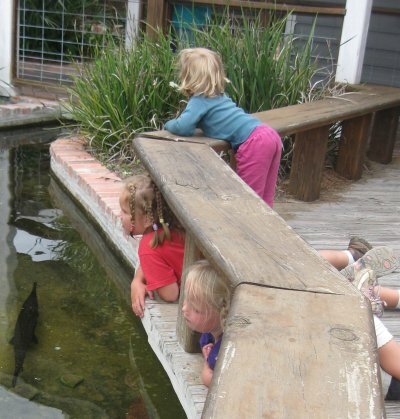 Cheyenne discovers that the fish come to her as she splashes the water. Cheyenne has been asking us how an airplane knows where to go. At the restaurant we meet a World War II and Korean War pilot. He explains that with the help of radio waves he could calculate where he was. We continue on the journey south. Brunswick is not that far. It is hard to tell when we are in the real part of town. We actually never get there. The highway takes us around it and there are no places that look appealing to spend the night and another day. We keep on going, aiming for the interstate. We might not be able to find shoes, but there will probably be a place to camp. Somewhere in the distance we see something very interesting. The tall pillars and cables of a very very very big bridge. Is the road really taking us there? Yes, the road is really taking us there. Gulp. We take a break to muster courage to take the bridge. That takes a while. The cars on the top of the bridge look like ants. There is no way around it, except for back tracking, so we keep going. 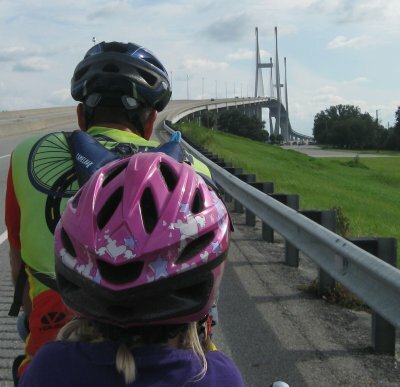 When we get to the bridge we see there is a broad shoulder for us to ride on. That is very encouraging. It gives us the chance to take a break to catch our breath from time to time. We need one of these when we are a third of the way up. We are not mistaken, it is a very tall bridge. The casino cruise ship looks like a little lego toy. And we are not even on top yet. We keep on going and going. And we make it to the top of the bridge. Just like we made it to the top of every mountain and every hill we already ascended on our journey sofar. You would think that we are flying down the bridge. But we are not. We are so high up, we would be going way to fast with no possibility of stopping. 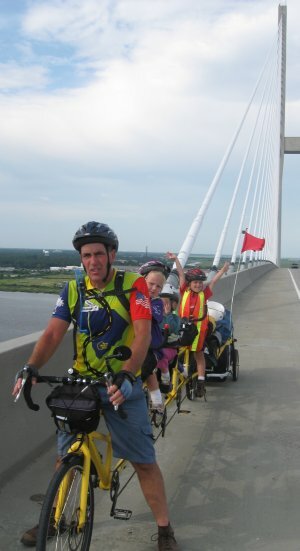 Bill keeps his hands on the breaks and we make it safely to the base of the bridge. Now we have another choice to make. With the bridge behind us, so is Brunswick. It is 6 more miles to the interstate, which is on our way to Florida. 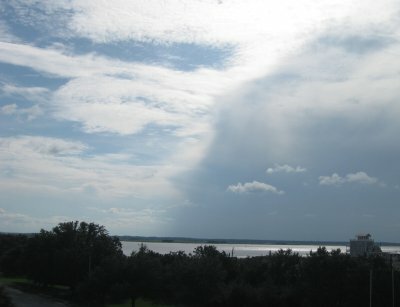 There is also a big rain cloud hanging over the interstate. 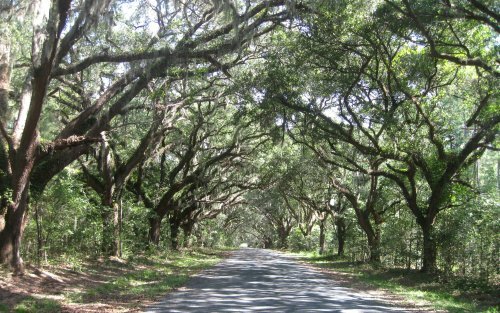 It is 6 more miles to Jekyll Island, a must see according to many, but out of our way. 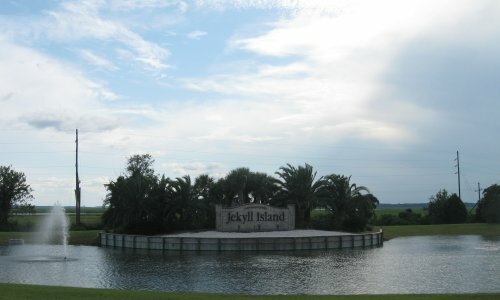 There is a campground on the island, so we choose to go to Jekyll Island. On our way to the island we look back once more at the bridge we just crossed. Phew, we are glad that one is behind us. 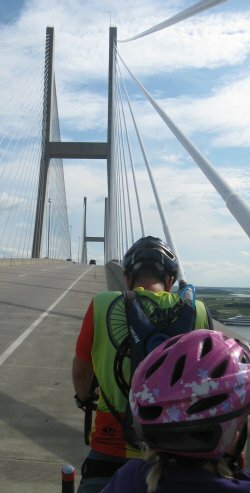 We pedal through the marshes, cross a minor bridge and stop at the collection point. Bicycles are free to enter the island. An interesting sign is posted at the collection point: "Campground Full". 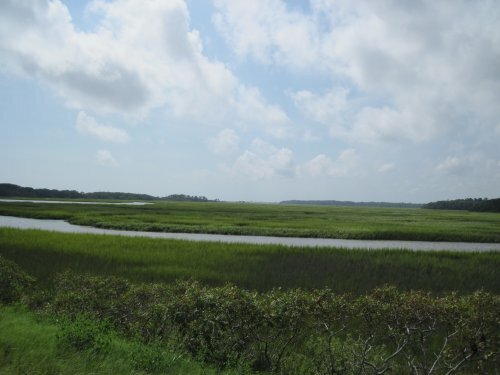 Besides this, it is another 5 miles to the north end of the island where the campground is located. We have pedalled so many miles today, we just don't want to do any more. We end up at the Days Inn, located on the Atlantic Ocean. Not a bad consolation price. Once we are in our room, we crash out for the night. It was a very long day. We were out for the night. Sleeping soundly in comfortable beds. When we wake up we engulf ourselves in the breakfast bar. Cereal, breads of all sorts, donuts, wafels, juices, milk, hot beverages, fruit. Something for everyone. The wafels you make yourself. It is a first for Amarins. It is actually quite simple. And mighty delicious! The Ocean is very inviting. It doesn't take us long to get dressed for water. Jumping in the water, looking at the (dead) horse shoe crabs, building a sand tower, there is no end to the joy a beach can give. Cheyenne jumping over the waves. Robin running across the beach. We spend the day swimming in the ocean, swimming in the pool, taking a nap in the room and more swimming in the pool. Bill gets to know the owner of the bicycle shop next to the motel. He takes the bicycle to the shop to fill up the tires. There they discover that one of the spokes in the rear tire is broken. This has created a wobble in the wheel and needs to be fixed. 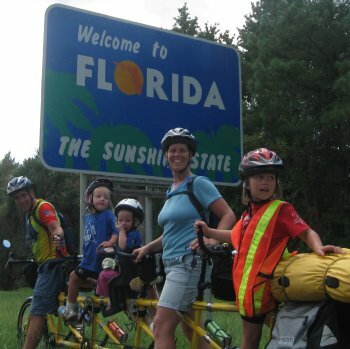 We are so glad we took the day off, are on the island and within reach of a bicycle store. Things just have a way of working out. We conclude the day with a walk and a sandwich. Tired from all the playing, it is no problem for us to fall asleep. 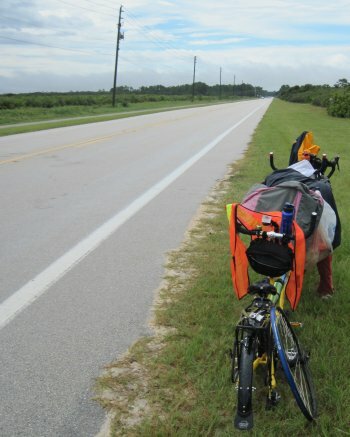 Tomorrow the bicycle will be fixed and we'll be heading back to the interstate. We sleep in, have breakfast, go swimming, have more breakfast and wait for the bicycle tire to return. We are doing a short day today. It is warming up, but that doesn't matter. We are almost ready to go when we receive a phone call. Woodbine is calling us! It is a town, about 35 miles down the road, wondering when we are coming to town. They would like to put up a sign for us. Since Woodbine is exactly as far as we want to go today, we are asking them to help us find a place to stay. We are riding back through the marshes. The bridge looms up on our right. No worries here, we are not going over it again. We are heading for the interstate. On our right we see huge ships. Transportation ships for foreign cars; Volvo, BMW, Mercedes. Parking lots full, waiting to be delivered elsewhere in the country. A train yard is adjacent to the port. On the tracks waits a very long train, with box cars. Ready to transport the cars to further destinations. It is a great example to show the girls the workings and importance of systems. If we had a bumpersticker on the trailer it would read "We stop for Slushies!". Many filling stations have slushies. At the interstate we've already done 14 miles. Time to treat the girls on a slushie. It is a nice break. It refreshes us enough to go to the next town. Waverly. 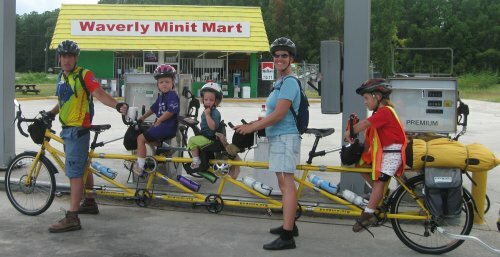 At the junction representing Waverly we stop at the Minit Mart. A real community store. There is a large variety of food, drinks and snacks. Owner Jay knows all the customers by name. On the counter the jumbo peanuts are boiling. Jay offers us one to try. It is our first boiled peanut ever. Even for Bill. Bill thinks they taste like pinto beans. Amarins decides on 'too interesting', more based on the texture then on the flavor. Camden County, Georgia, feels very welcoming. The scenery is beautiful and the people are friendly. We receive a lot of space on the road. It is an enjoyable ride. Before we know it we roll into Woodbine where we have a place to stay at the Stardust Lodge; a 1960's style, well kept motel. We have a 5.30pm appointment with the local newspaper, then a 6pm appointment with the Better Hometown committee. After talking with Susan of the Camden County Tribune, we decide to ride our bicycle to the committee meeting. 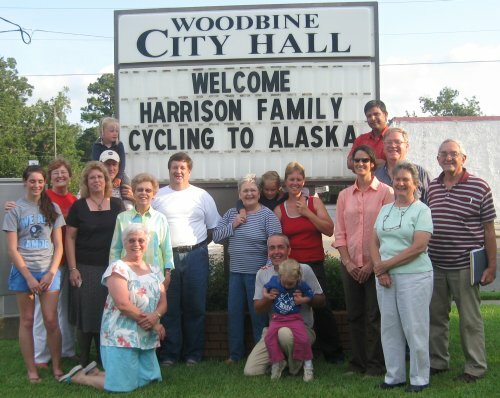 We almost fall off our bicycle when we see the welcome sign. This is great! At the meeting we get to share about our journey. Afterward we are invited to pizza and a movie. A great concept. The girls get to pick a movie. While they eat and watch, we have time to talk with Beth, Aubrey and Teri; all involved in this very welcome stay in Camden County. We are up early, but not because we are leaving early. Breakfast is waiting. Teri's wife Darlene is bringing breakfast to Aubreys home. Different kinds of biscuits, fruit, orange juice, coffee and milk. What a luxury. It is after nine when we finally leave the Stardust Lodge in Woodbine. Filled with great fellowship and a wonderful breakfast. In our panniers we have a lunch, provided by Creative Catering and Design, located in Woodbine. A couple of miles down the road is a natural spring. We plan on filling up our water bottles there. 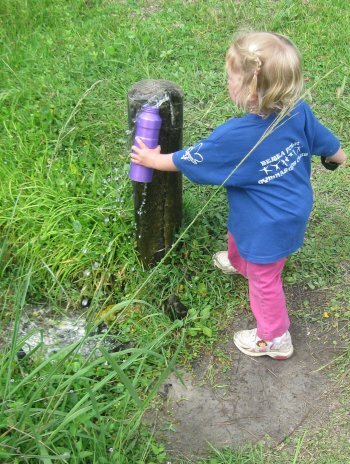 Robin fills up her bottle, she is so proud she can reaach it. Yet after the first smell and swig, we decide it is not for us. 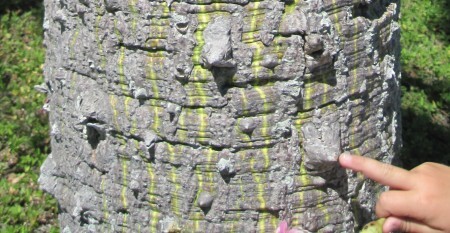 To much sulfur. Today we are going to state number six! Just before the Florida stateline we have lunch at the Habitat for Humanity Restore in Kingsland. Because we left so late this morning, the advantage of a cool morning is gone. We enjoy the AC tremendously. With the Restore crew we enjoy our incredible lunch. Sliced ham and swiss cheese served on a croissant, smoked turkey on whole grain bread and cold cold water. We are taking an extended lunch to enjoy everything. 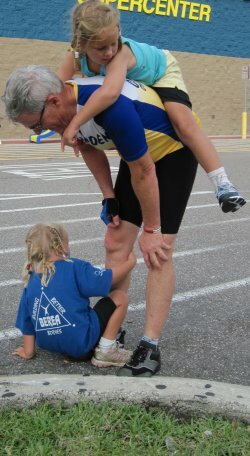 This gives Teri of the Camden Bicycle Center a chance to join us with his crew of volunteers. They have been painting bicycles on the road in St Mary. Then it is off again. Florida here we come! 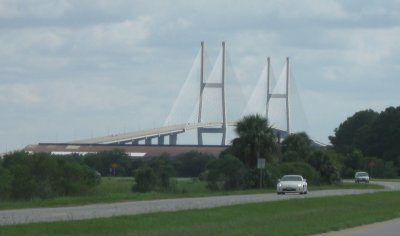 It is just a couple of miles and a very scary iron mesh draw bridge later when we roll into Florida. We stop to say goodbye to Teri. He came with us so we would have a picture with all five of us at the stateline this time. Angela is meeting us here too, as well as Mark, a fellow biker. Eight more miles to Yulee, then five more miles to Angelas home. We are very glad when we finally make it there. We feel very welcome. Angela has a surprise for the girls: little purses. They can decorate them with embroideries that need to be ironed on. They love it. Jasmine and Robin are in for an extra treat too. They get to dress up. How pretty. Mark, Teri and Darlene have come over to join us for a sandwich supper. Teri has his tools with him to straighten Bills crankarm. 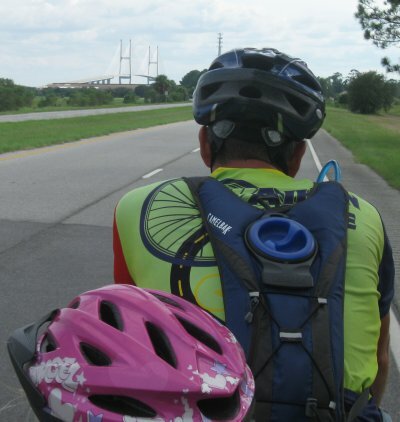 After the fall in Charleston, Bill has been riding with Jasmine's crankarm. It is actually a little shorter then Bill's. Bill has been complaining about his hips hurting. The shorter crankarm length could very well be the cause. Another problem solved. The crankarm is not totally straight, but much better then it was before. It is 6.30am. Angela has already left for work. Amarins fixes breakfast and sandwiches for lunch. Bill is getting the bicycle and trailer ready. The rack on top of the trailer is leaning very far to the right. Bill realizes that a threaded fastener is missing. Being a real MacGyver he fixes it with a couple of tie straps. We get on the road. A1A. We are going to stay on it for as much as possible until we get to Miami. 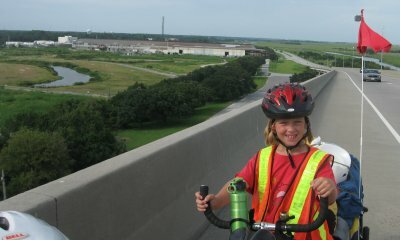 When we get back to the east side of I-95, two fellow bikers are coming to join us. Mark and Chuck from the Camden Bicycle Club. 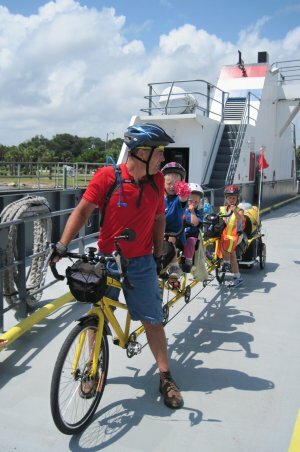 They will ride with us and guide us on the right roads until the St Johns River Ferry. Traffic is heavy, but with the wide shoulder there is plenty of space to share the road. We have to make a stop at Walmart. Robin fell with our camera yesterday and broke the lens. Cheyenne's shoes have been in need of replacement. At Walmart we can find both camera's and shoes. 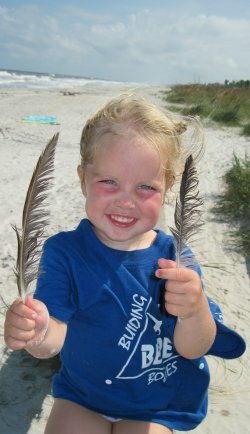 Pictures are part of why this website is visited more then 400 times every day. We choose to bite the bullet and for the first time since we are on this journey make a charge to our credit card. The new camera is a newer version of our old camera. The memory card is compatible. This means it will work with our little Acer. While Amarins is getting the camera ready for work, the girls are enjoying our new friends Mark and Chuck. After a Chick-Fil-A breakfast from Mark, a new camera and new shoes for Cheyenne, we are ready to roll again. It is enjoyable riding with Mark and Chuck. They know to take Amelia boulevard. This is like a little shortcut that takes us out of Fernandina Beach traffic. Live oaks with Spanish moss and marshes with many birds make for pretty scenery. To get to the St Johns Ferry, we go from island to island by bridge. The Atlantic Ocean is on our side. There is a brisk wind blowing. It feels good in this Florida weather. It is a long distance to the ferry. After about 35 miles we finally make it. The ferry goes every 30 minutes, so we decide to have a break with Mark and Chuck and do our radio interview on IMAX radio at 2pm. With lunch and the interview behind us, we send Mark and Chuck on. They need to ride the same road back to where they parked their car. They've sure done their miles today. When the ferry is back on our side of the water we get in line with the cars. We get to roll onboard before the cars do. The girls and Amarins get off the bike. Bill will have to hold on to it for the duration of the ride. The ferry ride is a new experience. Except for the loud honk of the horn when it takes off, the girls enjoy it well. We will be on many more ferries during the trip. This is a good first ride. Our next stop will be the bicycle shop in Jacksonville. We need a threaded fastener for the trailer. With the directions from Teri it is easy to find. We find friendly and helpful service, but no threaded fastener. We leave with the name and phone number of one of the workers. If we need anything, we need to call. Avenue 1 takes us further south. It runs parallel with A1A, but is much less traveled. From time to time we get to peek at the Ocean. It keeps being a beautiful sight. Within miles of our destination for today, a friends apartment, we stop to enjoy the beach once more. Now we have been at the Atlantic in South Carolina, Georgia and Florida. In Florida we will enjoy it many more times. We settle in at the apartment for the night. After supper, a bath and a movie we call it a day. With three ride days behind us already and no planned rest day ahead, we sleep in and take our time getting ready. We are going to St Augustine, not to far from Ponte Vedra. Starting late makes us start in a sprinkle. Within miles it turns into a downpour. A McDonalds comes to the rescue. We sit and decide on what to do. We are going to wait it out. While we wait we look at the map. It is a very undetailed coupon book map, so that doesn't make it much clearer on how many more miles it is to St Augustine. We are guessing about 20 and that is still 20 miles to many in rain. In St Augustine we are going to meet Ryan and Jenny, from Turner Classic Weddings. Not because of a wedding, but because they have invited us to stay with them tonight. With Ryan's knowledge of the area we come to realize they live 15 miles north west of downtown St Augustine. We choose not to take them up on this offer. Instead Ryan and Jenny will be our tourguides in St Augustine. We agree to meet at the bicycle expo that happens to take place in town today. When the rain clears out we are on our way once more. It is a beautiful ride through the dunes. Somewhere halfway we stop for a slushie. Then it is not to far to town anymore. We take the bridge back to the mainland. On top we have a nice view of the old town with the fort. Riding around the downtown area is truly impressive. There are beautiful buildings, old narrow roads, the fort still standing, horse and carriages. Very intruiging. We look forward to roaming the town later on. At the bicycle expo we meet Jeff from Champion Cycling in Jacksonville again. This works out great, because we have a broken spoke in our front tire. While Jeff fixes the front wheel, Bill fixes our first flat tire on the trailer. When all is fixed we are going with Ryan and Jenny to town. By car this time. It has started raining again. On our way to town we check at the state park for a campsite. To camp is about as expensive as to take a motel. Because of the rain we choose a motel for the night. Downtown awaits us. Ryan and Jenny are great guides. 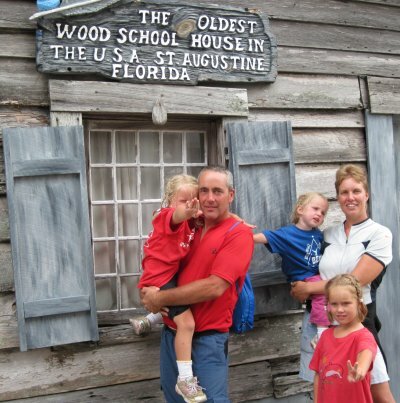 We get to see the cathedral, walk down St George Street, stop at the oldest wooden school building in the USA and go through the old gate out of town. On our way back we take a moment under the love tree. 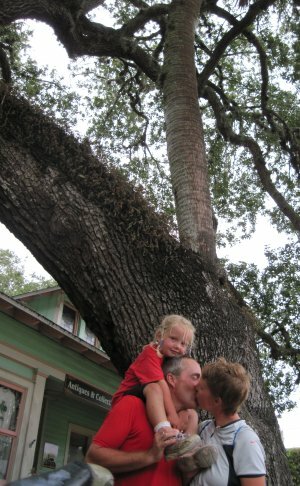 The love tree is a live oak that has grown around a palm tree, as if the oak is hugging the palm. The story is that if you kiss under the tree, your love will last forever. With forever lasting love we continue our walk to Flagler college. We would like to visit is, but the kids are done for the day, so we will have to take a rain check on that. 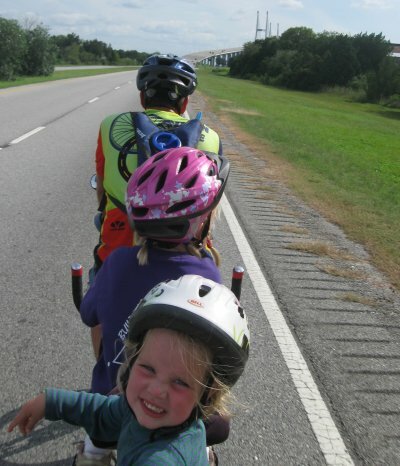 Ryan and Jenny bring Amarins and the girls back to the motel, while Bill will ride the bicycle there through the rain. Tonight holds a special treat for Cheyenne. She is going to the Ampitheater with Bill. They are going to watch the movie 'Endless Summer', about a couple of surfers following the waves around the world. They are picked up by Boston Joe (thanks for your generosity!). We met him at the Champion bicycle shop. Tonight he is accompanying Cheyenne and Bill to the movie. Early in, early out. There is a bicycle ride to attend. The ride starts at the bicycle expo. We think it will be fun to see everyone take off. At 7.15am we are back at the expo. What a sight. Hundreds of cyclists, single bikes and tandems. We are having as much fun looking at everyone else as they have at looking at us. At 7.30am they are off. Whoosh whoosh whoosh, they go by. When the biggest mass is past, we take off too. We are actually going in the same direction for a little while. Then they are off to the right and we are continuing on our journey south. The rain has started again. We take the first opportunity to get out of it. A filling station is just the place. Our bicycle can be parked under the overhang. While we are waiting for the rain to lighten up, tour riders are stopping by. Curious if they took the wrong turn, Amarins walks up to them and finds out there are different lengths they could choose. We happen to be on the road where the 30 mile tour takes place. When the rain lightens up we are off again. After a couple of miles one of the tour volunteers waves us off the road. We have arrived at the turning point. Amarins explains we are not part of the tour, to which the volunteer simple replies 'Now you are'. We are welcome to have a break with the tour riders and enjoy the fresh fruit, cookies and ice cold lemonade. Thanks! We are leaving Marineland behind us. We still have 30 miles to Ormond Beach. Eventhough we started early, all the extra stops due to rain, hasn't really gotten us far yet. It is time to put some effort into pedalling. We are cruising along, dodging the rain when suddenly we hear a gunshot. Well, that is what we thought it was. We have blown our tire. Not just the inner tube, but the outside as well. Amarins and the girls are huddling under our tarp, staying out of the rain. Bill is going to fix the tire. Then he realizes the outer tire is shot. And this time we are not carrying a spare. We are stuck. And we just happen to be in a desolate part of Florida. It is odd. No one stops, eventhough it is clear we can't go further. 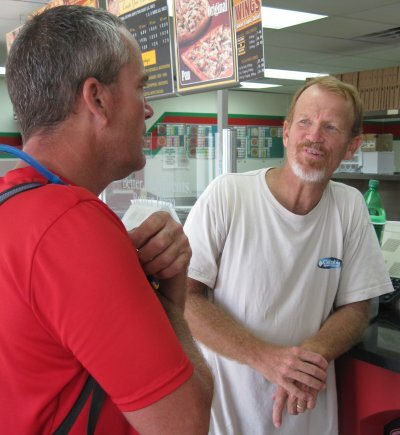 It is time to call our help, eventhough he is all the way in Jacksonville Beach: Jeff. Voicemail... As Bill leaves a voicemail, a car actually stops! Off duty police officer Ryan to the rescue. He has coffee and a phone and tons of knowledgeable friends. He calls bicycle store after store. But it is Sunday and the stores are closed. With the measurements of the tires, he is off to Walmart. And we are back to waiting. While Ryan is on his way to Walmart, Jeff calls us back. Yes he can help. He is going to call Boston Joe. Boston Joe will be bringing us new tires. Hope is on the horizon! This works out great, because Walmart doesn't carry the right tires. As we wait, the rain pulls out. We get a chance to look around and see where we are. Very close to the ocean it turns out. We are making lemonade out of lemons and walk to the ocean. Wow, how beautiful. There are rocks all over the beach. The tide is rolling in. A great display of erosion. 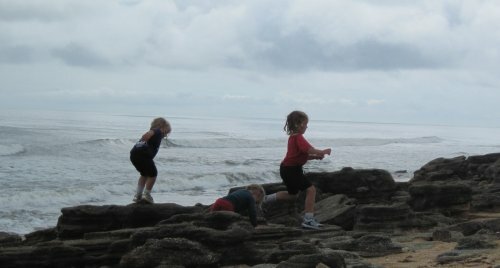 The rocks are great for jumping, exploring, discovering and lots and lots of entertainment. The ocean is such a beautiful place to spend time. We are so thankful that we blew our tire near the ocean. It sure has given us an opportunity to enjoy our surroundings. We stay for almost two hours. The sun has come out. It is getting hot. Instead of using the tarp to shield from the rain, we are now using it to protect against the sun. Amarins jumps on the opportunity to use her pocket knife. The dead palmetto branches work great as stakes to uphold the tarp. It is turning into quite a nice tent. We enjoy the breeze and the shade. We talk a little, play a little, hang a little and wait some more. Then, here they are, Jeff and Joe have arrived. They brought lunch too! Jeff decided to come with Joe, so he could fix our tire. He brought an extra liner and a new inner tube as well. While we enjoy our lunch, our tire gets fixed for us. After a four and a half hour break we are back 'in business'. Thanks again Jeff and Joe! Only 30 more miles to go. The rest has done us very well. We are off and cruising. We are pushing hard, ready to get to Ormond Beach. The road is right on the edge of the ocean. It is beautiful. First we get to Flagler Beach. A family is waving at us and holds up one of our cards. This sparks our curiosity so we pull over. 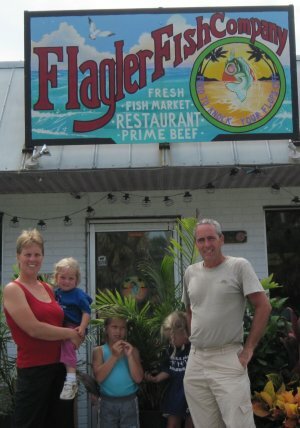 This is the family that owns the Flagler Fish Company. They had send us a message inviting us to have lunch at their restaurant. 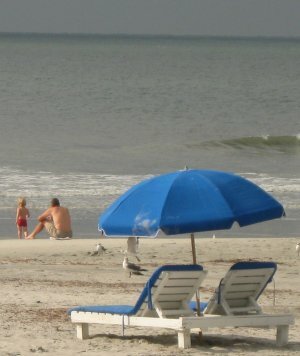 They heard about our trip while celebrating their 10th wedding anniversity on Jekyll Island. Too bad the restaurant is closed on Sunday. If we are still in the area tomorrow we are welcome to come for lunch. After this brief break we are off again. It is still 17 miles and we are so tired. We are ready for this day to end. We would love to be at our destination for today. We can smell the chicken cooking. We can almost hear the fish sizzling on the grill. We keep on going and we finally get to within a quarter mile. Pop, another blowout. Can you hear us yell with frustration?! How can this happen, it's a brand new tire. We give Dorothy a call to ask if she can please come and pick up the girls. Not a problem. Within the blink of an eye a big van pulls over. They are on their way to Dorothy and ED's home. They are having supper with us. Would we like a ride? The girls are already in the van when Dorothy pulls up. Bill pushes the bike the last little bit. Amarins and the girls get a free ride. The swimming pool is waiting. No need to change into bathing suits, just jump in. The girls are loving it. When the girls are refreshed and reclothed, we sit down for supper. Friends Jim and Carla (from the van) and Bud are joining us for supper too. The girls finish quickly and are off exploring the toys. Cheyenne discovers the National Geographic and sits down with it. Not long afer supper we call it a day. Tomorrow we sleep in. We have another tire to fix. We wake up to the smell of french toast and fresh coffee. The table is set with cereal, orange juice and a boiled egg for Jasmine. We are undecided on what we are going to do today. We are in need of a day off, but we also want to be in Fort Pierce by Friday. This would give us the weekend there. Regardless of what we do, there is time to go swimming. Cheyenne and Robin are ready to go. Jasmine goes to the bicycle store with Bill. 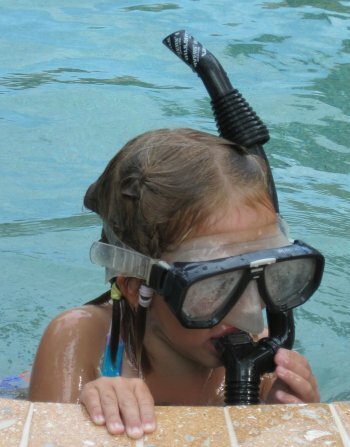 Cheyenne is trying to use a snorkle. How to breathe through it is quite a puzzle. Bill gets back with two new Armadillo tires. Puncture proof. Now we can get back on the road. Since it is already in the afternoon, we decide to spend the rest of the day here. 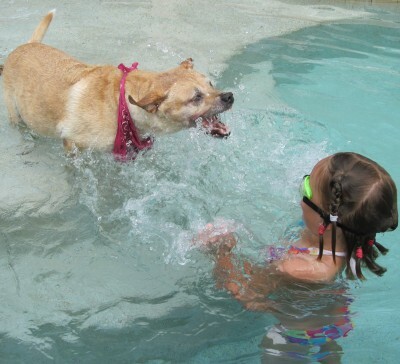 Jasmine joins Robin and Cheyenne in the pool. Since we are still in the area, we invite Jim and Carla to have lunch with us at the Flagler Fish Company. Dorothy and ED are at a meeting elsewhere. We are graciously fed with a wonderful meal and a great dessert. The flavor of the food is incredibly good. The girls eat their plates totally empty. The remainder of the afternoon we spend in the company of Jim and Carla. They show us the old Indigo Plantations that are now canalled marshes or estuaries. 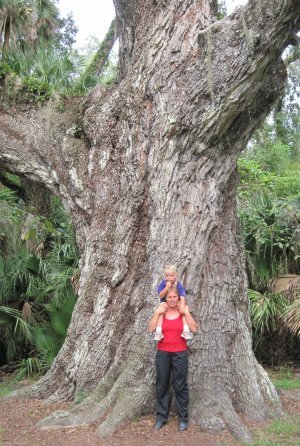 We take a walk at a little park where over 200 yr old oak trees are still standing. On the way back we stop to catch the fresh air at the ocean. At the Mann's residence the girls go straight back to the pool. With our stomacks still full from the delicious lunch we don't need much for supper. 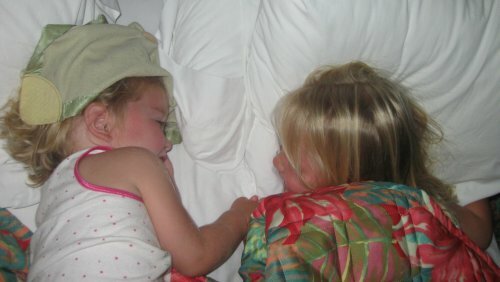 Bedtime comes early for the girls. Tomorrow we are moving further south. The Manns are already up when we get downstairs. Again breakfast is waiting. Thank you so much. We left by 7.45am and ride alongside the river. The sun is hidden behind the clouds. We ride through beautiful downtown Daytona. After a donut in Port Orange we are back on A1A at New Smyrna Beach. We are cruising. It is only 11am. We are going to have a quick lunch somewhere then ride another 10 or 20 miles and call it a day. Huh??? What did that sign say? 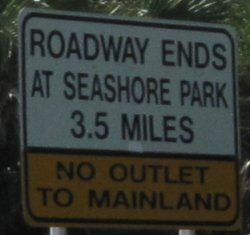 The road is going to end and there is no outlet to the mainland? We hit the breaks and ask the first person available. The sign says what it says. We are on a deadend road. Even if it is called A1A. Argh!!! We just went 8 miles out of our way. We have to go the same 8 miles back. This does not make us happy. Lunch will have to wait until we are back on US-1. We put our legs to work and before we know it we are back in the right direction. Is Papa John's for lunch. While we wait for pizza Ken, a fellow biker, comes in. We met him a little earlier. He was on his way back from a 52 mile loop. He's been all over the US, north to south, eaast to west. He's probably circled the globe several times. He has been looking for us. Of course he didn't count on us doing the detour. He was just about to give up when he saw our big yellow bike again. Ken comes in with a big box of icecream. It is a true treat. Now we can hit the road again. We are looking for a place to pitch our tent. It's been enough for today. Finding a campsite is the hardest thing of all as it turns out. The RV campgrounds don't accept tents. We stumble upon an administrative office in Oak Hill, a hole in the wall. 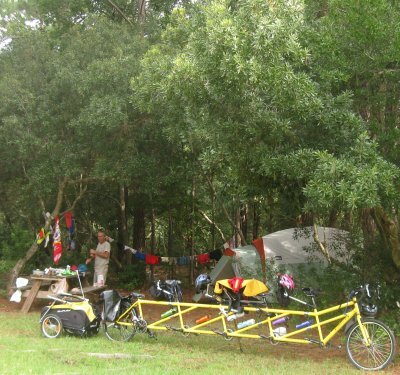 Next to their building is a beautiful shade tree and plenty of place for us to put our tent. But no, we can not put our tent there. The ladies at the administrative office are very unhelpful. We keep on going and going and going. There just isn't a place to camp. None of the people we talk with has a yard for us or another option. It makes us feel very unwelcome. We laugh at the sign in Mims 'The Friendly Town'. We can't say we agree. It is after six when we limp into Titusville. Still no camping space. Enough is enough, we are taking a motel. Once more we have a flat tire. The rear tire also has a couple of broken spokes. We are feeling as deflated as our tire with this situation. In the realization that a bike hardware change is in the process. Our bicycle has definitely not been outfitted for our intense journey. It is a true disappointment to be limping like this after only a thousand miles. It is dwindling our spirit and it is certainly dwindling our little monetary resources. Check out time is 10am. We are not making it. The spokes and the tire need to be fixed before we can leave. The bicycle store in town doesn't open till 10am. We add another night in the motel. A day off is great to do some thinking. The rims are not made for our journey. We are going to invest in two new ones. 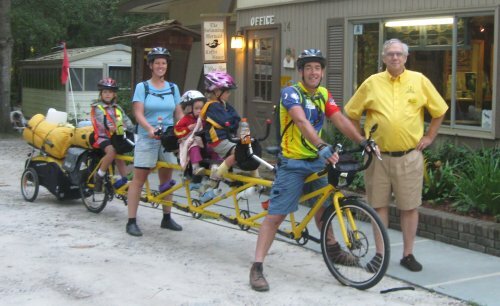 We call Lyle from Spin Lite Cycling in Hiawassee, Georgia. He can builds us rims that will last. We look at the map of Florida. We take into consideration the intense traffic on A1A. 'We are not in Kansas any more', as Bill likes to say. 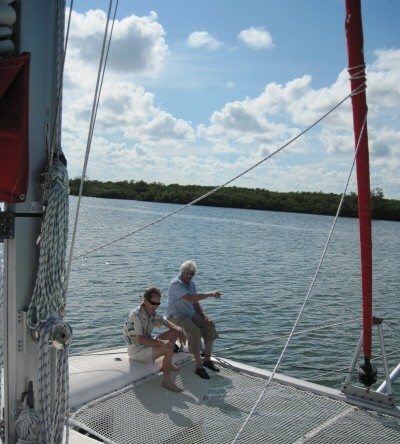 We decide to end the second leg of our journey in Fort Pierce and thus not go all the way to the Florida Keys. The girls enjoy the swimming pool. Bill rides the bicycle to the store to have it repaired. Amarins works on the internet. We are making lemonade once more. The rest feels good. We check into going to Cape Canaveral, but realize soon that does not fit our budget. It also deserves more time then we have available. Perhaps when the girls are all tall enough to go in the space ride. In the afternoon we go for a walk and stumble upon a little park. 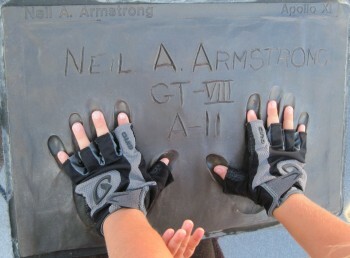 It is dedicated to the astronauts. 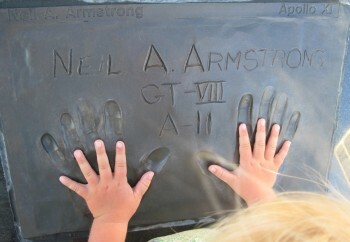 The girls have the opportunity to put their hands in the hands of Neil Armstrong. A nice walk. A fixed bicycle. Rested bodies. New plans. We feel ready to ride once more tomorrow. Weather: Hot and humid quickly. We are up and going at the crack of dawn. 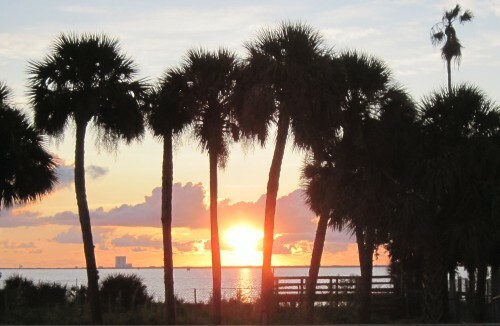 The sun is playing peek-a-boo behind the buildings on the island. The view from the main land across the river is astounding. We pedal past the turn off to the Space Center. There is nothing to see but the signs. When we get to the causeway to Cocoa Beach we strain our necks to see a space shuttle. To no avail. Maybe next time. It is warming up quickly. We take many breaks. Now we are looking for a place to lunch. A little Greek restaurant spikes our attention. We hope we can take a rest there. We have Sebastian Inlet State Park in mind as our final destination for today. It is still about 25 miles, but at least we know there is a place to camp. At the restaurant we meet a group of tennis players. One of the ladies is a freelance writer for, among others, the local paper. She knows a story when she sees one. She borrows a camera, a pen and a notepad and goes to work. After the interview we take our time for lunch. When we are almost finished, the reporter comes back. She thought the girls looked like they could use a pool and some rest. Would we like to stay at her house? Yes, of course! Pumpkin is part of the fun! She loves splashing in the water and being splashed at. After we have refreshed ourselves in the swimming pool (and have eaten all the chocolate cookies...), it is time for some music. 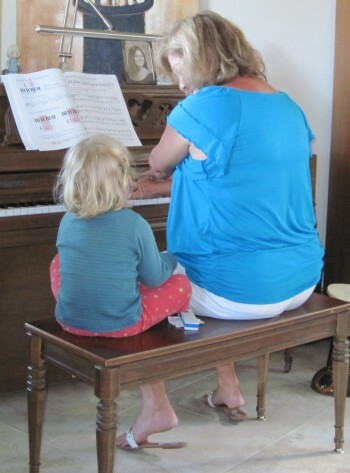 Cheyenne is testing the guitar, Robin is playing the harmonica and Jasmine is plinging the piano. Robin and Debbie in concert! It is truly a beautiful sound. It is survivor night. Debbie's parents come over and bring pizza. 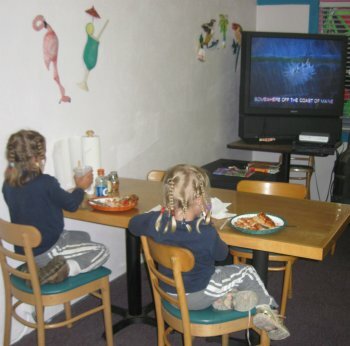 It is their custom to watch survivor together. It is a delightful get together. Weather: Loving the cloud cover. Our stay with Debbie has been heart warming. We feel like we have known each other for a long time. 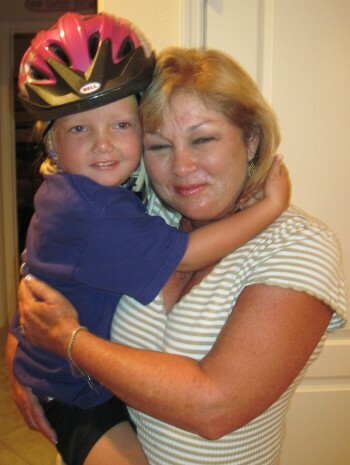 Jasmine gives Debbie a big bear hug as we get ready to head for Fort Pierce. With a good feeling we are back on A1A. The sunrise once more smiles in our faces. It is going to be a hot day, but with an early start we should be halfway before lunch time. 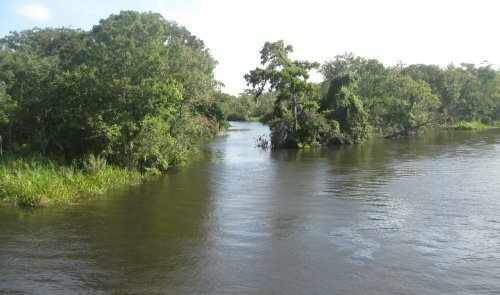 The Ocean on our left, the river on our right. Fish are jumping across the water, there are birds abound. The miles are passing quickly. It is only 10am when we reach Sebastian Inlet State Park. 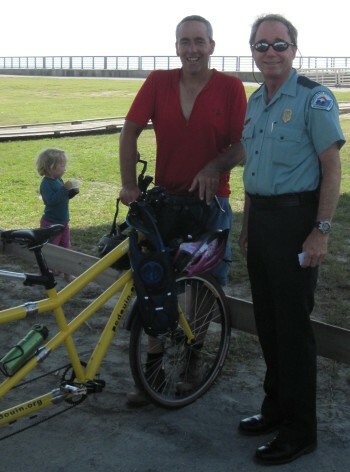 At the park we meet a wonderful park ranger, a fellow biker it turns out. He shares his travels through Europe with us. What an experiences he has. We are very thankful we had a chance to meet him. It is already very hot, so we decide to hang around for a while. We sit under the bridge. 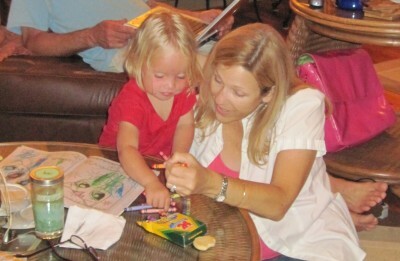 The girls are enjoying their new coloring books. It is an enjoyable place to spend time. It is lunch time when we are back on the road. We are heading for Vero Beach. It will be time for a slushy by then. We pedal, we rest, we snack and we are getting there. From Vero Beach we contact Wally. Wally is going to ride in with us. It is at Wally and Betty Ann's house where we are going to spend the weekend. A real weekend off! It is hard to imagine. With slushy strenght, we continue south. It is not long when we see Wally and friend Bob. 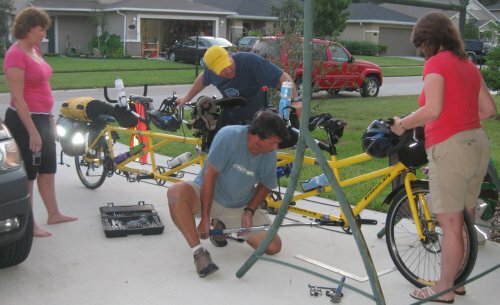 Wally is riding a recumbent-sort-of bicycle with a set of Z-torques. That is a newly developed set of cranks. The path is wide enough to ride together. It gives Bill and Wally time to do some catching up. Just before Fort Pierce we turn into a little park. 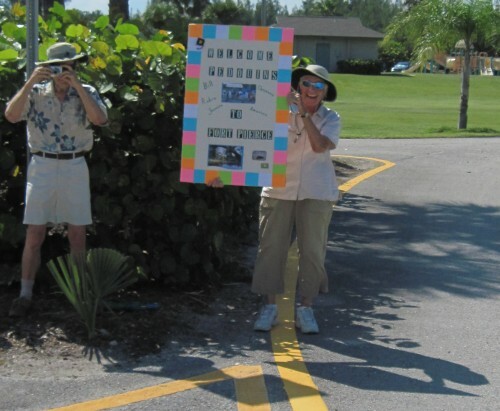 Wally's parents are waiting for us with a beautiful 'Welcome to Fort Pierce' sign. We get off the bicycle and are treated on real Dutch Stroopwafels. Yummy! We are taking the last miles at a leisure pace. The heat is very intense. Even without exercise it saps you. We are so relieved when the Brollman residence is in sight. We unpack the trailer. The bathing suits need to be found. There is a swimming pool waiting. The girls are all over Bill and Wally. Especially when they can use Wally as a rocket launch! The girls have never done as much swimming as they have on this journey. We wake up with the ocean on our minds. Today we are going to take a Catmaran to the Atlantic Ocean. What an experience it is going to be. Breakfast is done. The boat is packed. 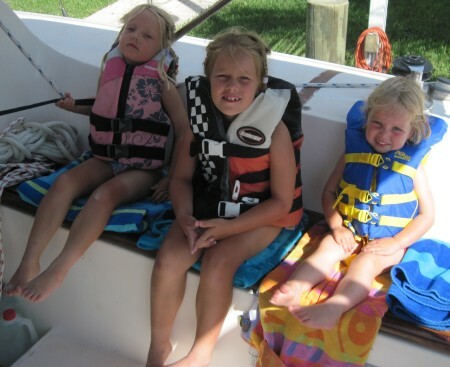 The girls are wrapped up in life jackets. We are ready to sail. All Pedouins, Oma and Opa Brollman, Wally and Captain Jimmy are accounted for. Take her to sea Jimmy! 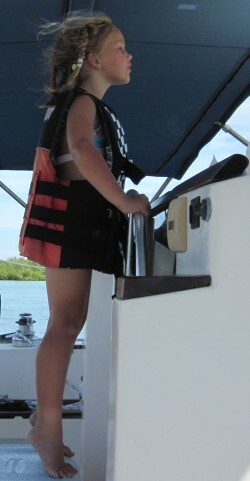 The outboard motor splutters, but eventually keeps running. We are on our way to the draw bridge. Jimmy calls ahead and within no time the bridge opens for us. 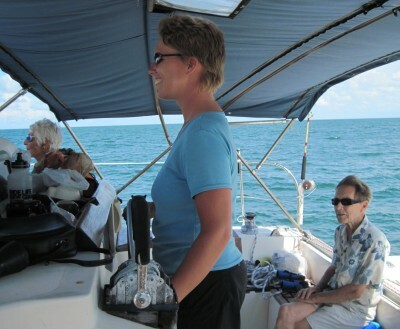 When we get to the inlet, Cheyenne takes the wheel and takes us out to sea. Hoist the sails! Turn off all engines! Let the wind move us forward. 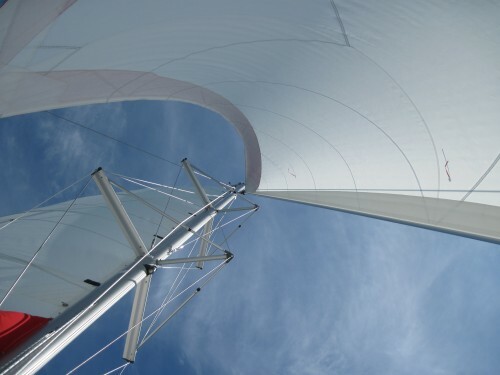 It is a peaceful experience when the engine is turned off and the sails take over. It brings back good memories to Amarins. For several hours we sail south. We catch a spotted mackerel for supper. A huge kingfish escapes us. Jasmine is licking her lips already. The net at the front is great to hang out. The sail provides a nice shady spot. The splashing of the waves is soothing. Jasmine and Robin soon fall asleep. We all get a turn at sailing. Cheyenne uses a cool box to stand on. It makes her just tall enough to see what is ahead of her. Towards the end of the day, Amarins gets a turn. She gets to take her back into the inlet. It is a battle with the incoming wind and the outgoing tide. The wind is the winner and we sail through the rough waves to the river. Cheyenne takes the wheel and takes the ship through the bridge (after it has opened of course). As an added bonus to this wonderful day at the ocean, we see the dolphins swimming in the distance. It makes it an even more magical day. Opa and Oma Brollman enjoy the journey very much too. 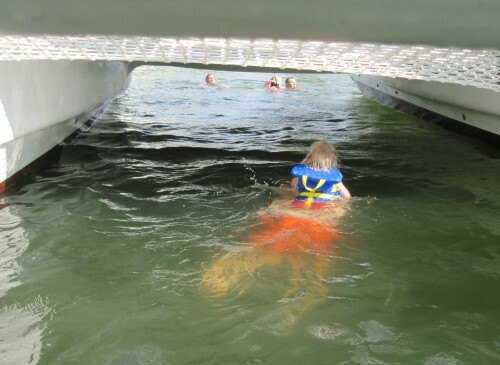 We finish the journey with a swim under the boat. It is a bit exiting for the girls, but after doing it once they want to do it over and over again. What's for supper? Fish is for supper! And several deliscious side dishes. With a full belly of joy and food the girls are going to bed with a smile on their faces. It isn't much later when we turn in too. The morning brings us back to our old church and old friends. Bill shares his experiences in Israel with the Sunday school class. It is very interesting. The girls have a new experience in a class room setting. That has been a while. The afternoon is totally restful, with just hanging out at the Brollmans residence. With the exception for a tv interview with ABC in West Palm Beach. The evening gives us a chance to go out on a date. We walk up and down the jetty and enjoy the nightsky. Amazingly enough we didn't take any pictures today! Bill takes the bicycle to Wally's shop to show the boys that he actually made it here! The remainder of the day he works on it again. Spokes need to be replaced again. (We are so looking forward to our new rims!) Bill gets a new set of crankarms: Z-torques! Another restday for Amarins and the girls. We have plans to go to the library, but to our disappointment it is closed today! Plenty of other things to do. Betty Ann has left us the car. After breakfast and doing some artwork we are going to town. We drive by the library; the place that has been a turning point in our lives. We go over the causeway to the south island. Amarins knows her way around well, due to living here before. Soon we are at the playground. It is still partly shaded. The girls are having a great time. They play, they run, they climb, they hang. 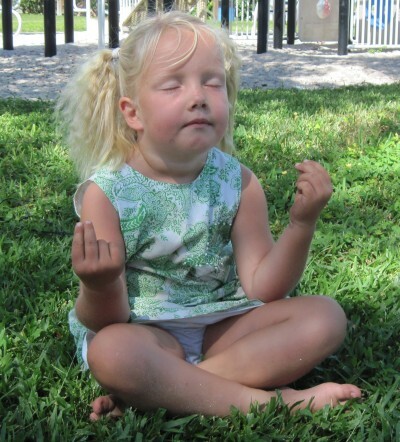 Then Jasmine decides it is time for an 'o mani padme hum' moment. 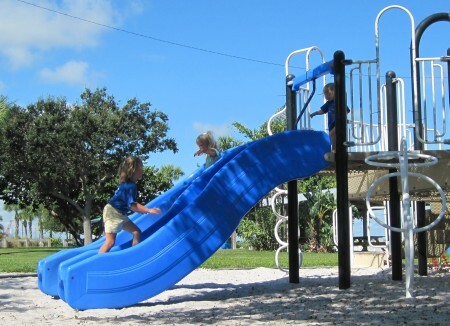 The playground is set in a nice location on the inlet, surrounded by many trees and picnic places. Just as we are walking to the car, Cheyenne discovers a mystery tree. The bark has sharp thorns on it, it makes her think of the Devil's walking stick. 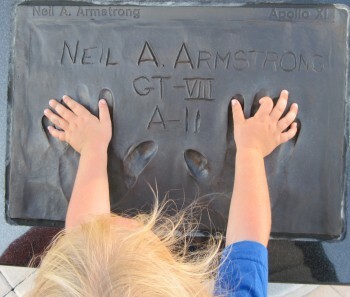 She remembers seeing it at Bob and Jane's home, back home in Kentucky. 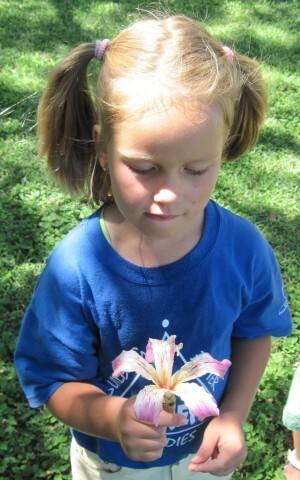 Cheyenne is holding a fallen flower. The mystery tree is full of them. We end the morning with a walk on the jetty. It is our good bye to the Atlantic Ocean. Tomorrow we will be turning our back to it and turn inland to Lake Okeechobee. It is to hot to go swimming, thus we postpone it to later in the afternoon. The afternoon we are back at the Brollmans residence. Robin and Jasmine nap, Cheyenne and Amarins watch some tv and do some reading and writing. When everyone is back awake, we head out the door and go swimming in the inlet. It is already after five, but it is still warm. There are many children to play with. More good memories are created. As we come back home, Wally and Bill have also rolled in. Bill and Wally rode the bicycle back home. A thrilling experience for Wally. It is rather wobbly if you're not used to it. When Betty Ann gets home, the girls swamp her with artwork. Betty Ann needs to color too! 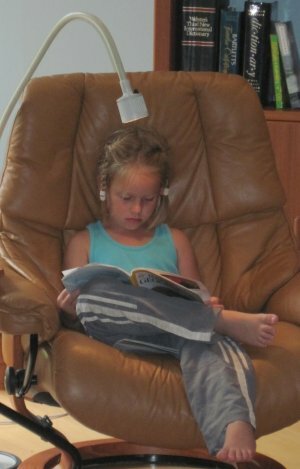 It is wonderful getting the full attention of a grown up. After coloring the feast is not over yet! Oma and Opa Brollman brought us a true Dutch treat: Beschuit met muisjes! It is a great way to close a wonderful weekend with the Brollmans. Thanks for having us with you! Fort Pierce, Florida to Lucedale, Mississippi!